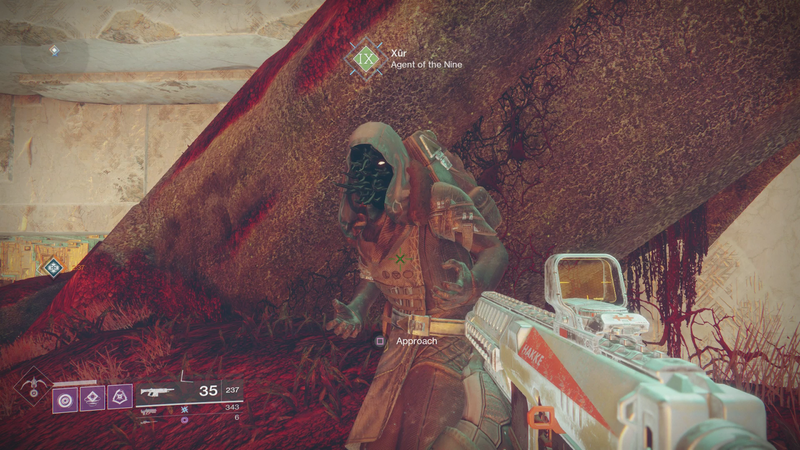 Getting great loot in Destiny 2 means hunting down Xur, the mysterious squid-faced weapons merchant who probably feels strange to kiss. In Destiny, that meant searching the Tower high and low until you stumbled upon him. Thankfully, it’s much easier this time around. Xur is a strange merchant who shows up once a week with exotic weapons and armor. A furtive agent of the Nine, he presumably serves his shadowy master by giving players rad loot. In Destiny, Xur would show up in a random location in the game’s social hub. Destiny 2 makes it much easier. Although Xur has taken to showing up on random planets, he now shows up on your map. Which means everyone can stop writing search engine optimized posts about where to find Xur. Even if they won’t. And even if I just kind of did. He’s on Nessus this week, where I never would have thought to look. Imagine my surprise when I decided to quickly log in to finish my weekly flashpoint quest and saw him right on the map. It’s so much better than running around or checking on Reddit to see where he might be lurking. It streamlines the process, which is something Destiny 2 excels at. Buying loot from Xur is a lot easier too. Instead of using Strange Coins, a semi-rare currency found in the first game, players can just use legendary shards. Any time you disassemble a legendary item, it gives shards that can be used to “ascend” guns to a high level. But Destiny 2 is very generous with loot, which meant I easily had enough shards to purchase the boss-melting fusion rifle Merciless. Destiny 2’s been a blast so far, but making the hunt for Xur easier is probably one of my favorite quality of life improvements. I have fond memories of purchasing Icebreaker and Heart of the Praxic Fire in Destiny before the grind wore me down. With so many shards and a map that leads me directly to Mr. Squid-Face, I think this will be the start of a wonderful friendship.